Relive the Sixty-Ninth ATLA Annual Conference in Denver, Colorado, by downloading a copy of the 2015 Summary of Proceedings. This year’s Proceedings includes the full presentations from plenary speakers, Kathryn Reklis and James LaRue, and a report on the Interfaith Panel written by Laura Harris. Enjoy papers, presentations and panels from theological librarians around the world, including “Beyond the Number: Diversity Management in Academic Theological Libraries” by Jaeyon Lucy Chang; “Caring for Special Collections and Archives on a Shoestring Budget: Low-cost Strategies for Theological Libraries” by Armin Siedlecki, Lyle Buettner, and Christopher J. Anderson; and “Lights! Camera! Learn! Marketing Library Services & Training Library Users” by Sara Baron and Melody Diehl. The Proceedings also includes reports from the Denominational Groups, Interest Groups, and Committees, and also includes the organizational and membership​ directories, the Association of Theological Schools (ATS) and ATLA Library Statistical Report, and the Association Bylaws. This year’s Proceedings is available in EPUB and PDF versions and can be found here. 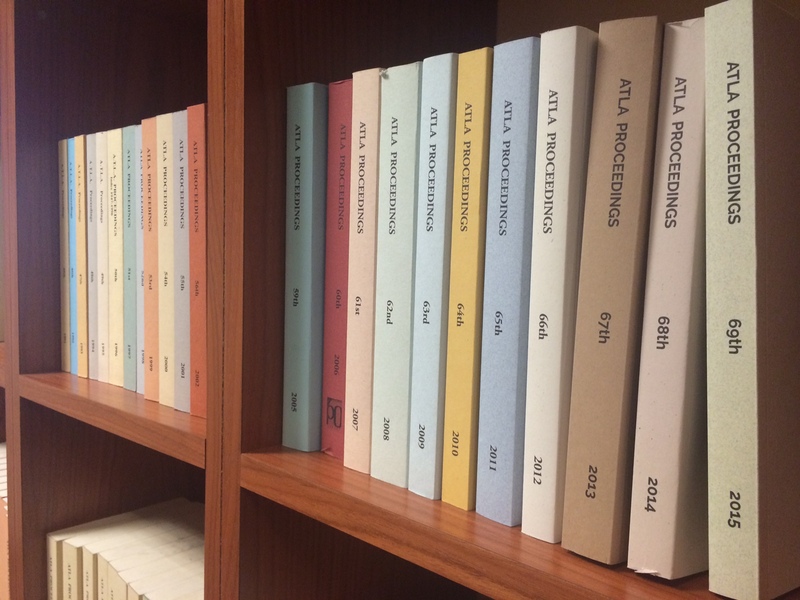 The full text of each edition of the Proceedings is also available in ATLASerials®. Members may log in to access the Proceedings under the Community. All Individual, Student, and Lifetime Members and Institutional, International Institutions, and Affiliate Member Representatives will receive a copy of the Proceedings. Printed editions were mailed out the first week of March. Non-members may subscribe for the printed edition at $60 domestic and $80 international per volume. Contact a membership associate for more information on subscribing.